These sandwiches are delicious, and the meat is so flavorful. Your house will smell divine too! So easy to make in the crockpot and then toast them up on the oven when ready to eat. 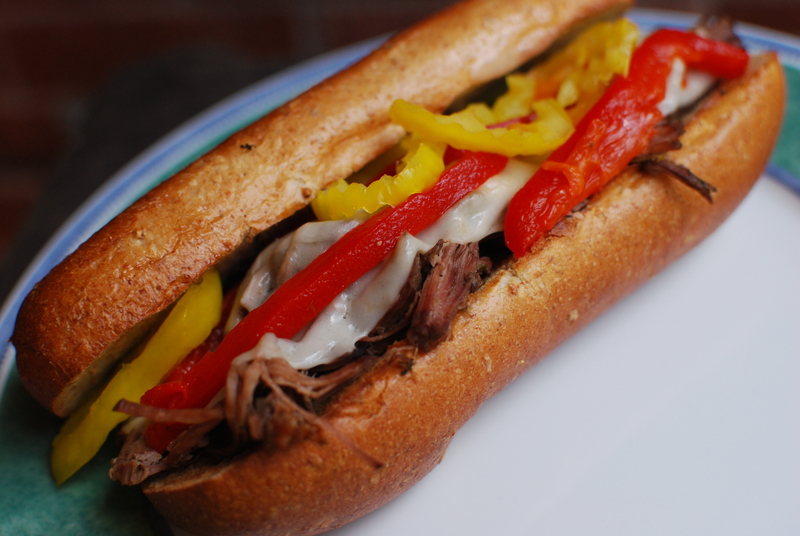 The roasted red peppers and mild/hot pepper rings brighten the sandwiches up and give them delicious flavor. Turn 6 quart slow cooker to high heat. Add boiling water, beef bouillon and Worcestershire. Combine remaining seasonings in a small bowl. Sprinkle over beef broth and whisk to combine. Add roast and flip to coat both sides. Cover and cook on high for 4 hours or low 8-10 hours. Shred beef by using two forks to pull it apart. Stir to coat all beef in the juices. Cook 1 additional hour covered. (Do not drain) Really not necessary, so you can skip this step. When ready to serve: Slice rolls in half, place on a baking sheet and broil in oven for 2-4 minutes until bread is lightly golden brown. Scoop beef on toasted roll and top with 2 slices of provolone cheese. Place back on baking sheet and broil until cheese is melted. Top with red pepper slices and mild pepper rings.